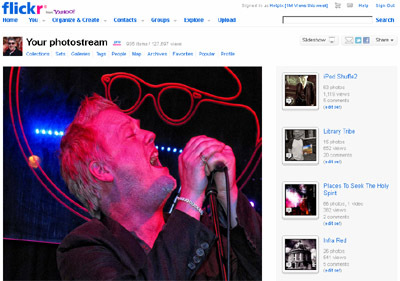 Flickr provides access to Tony Smiths various photography projects. He has been a keen photographer for over thirty years. Around a 1,000 images are arranged in a number of sets, covering various subjects, locations, techniques and genres. These include portraiture, live bands/musicians, including work over 15 years for the Northwich based BANNED! music project (supported by DANARTS - Development of the Arts in Northwich) and social media work. Tony is active in his own community and has documented local libraries, the Warrington Winter Night Shelter and been involved in various voluntary projects, such as the highly successful DAD (Disability Awareness Day) held locally every year. He has recently (November 2012) been involved with social media and publicity for the project to re-open his local library in Grappenhall, Cheshire. Tony completed a 365 project in 2009 and these can be followed in a set on Flickr. A perfect way to expand photographic skills and find how to get the best from your camera and equipment, whatever your ability. Many city images feature, including panoramas, transport, technology and other themes. Images can be licensed via Alamy for various uses, from only 6 US dollars. Flickr images must not be used without payment, please contact us with any specific enquiries. Also, let us know any special photo needs.